Nobody does recycled couture quite like Maison Martin Margiela. Spotted on Facebook: the atelier’s smoking jacket from Autumn/Winter 2009, which is on view at Museum Rotterdam until September 30. Assembled from hundreds of blue Bic pen caps strung on cotton ribbon, the jacket will join Werkstij (“work style”), an exhibit that examines the intersection of function and fashion. Nobody does recycled couture quite like Maison Martin Margiela. Spotted on Facebook: the atelier's smoking jacket from Autumn/Winter 2009, which is on view at Museum Rotterdam until September 30. 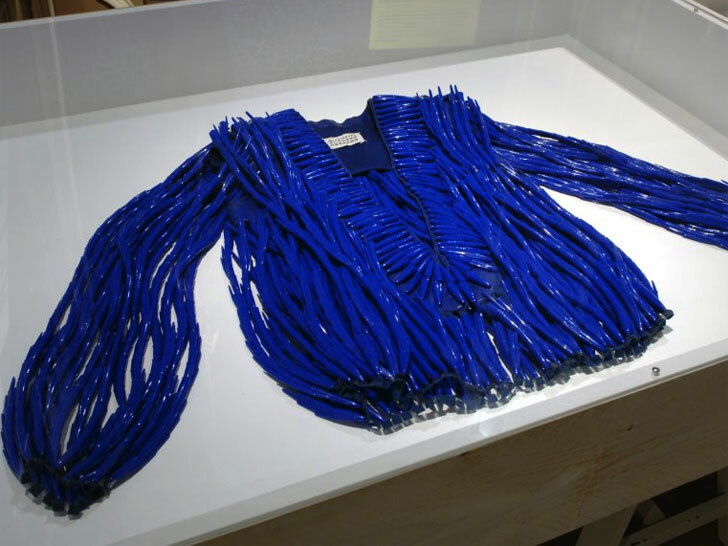 Assembled from hundreds of blue Bic pen caps strung on cotton ribbon, the jacket will join Werkstij ("work style"), an exhibit that examines the intersection of function and fashion.